Lapels Dry Cleaning, an innovative, environmentally friendly dry cleaning company headquartered in Hanover, Massachusetts, was recently named to Entrepreneur magazine’s list of vet-friendly franchises for 2018. Lapels Dry Cleaning was ranked 55 of franchises listed. Lapels Franchising offers a 20 percent discount on Initial Franchise Fees to our Veterans. Additionally, Lapels will also pay up to $6,000 in fees in assisting veteran franchise owners in finding the correct lending institution to open their franchise. Lapels Dry Cleaning of Littleton, Colorado has a program where it will clean uniform hats for veterans. Most if not all Lapels Dry Cleaning locations will offer discounted uniforms and flag cleaning services. And then there’s Lapels Dry Cleaning of OKC Owner Brian Culver. A former Navy pilot, Culver has set up a suit donation drive to benefit the local chapter of the Paralyzed Veterans of America. To learn more about franchise opportunities for veterans with Lapels Dry Cleaning, call toll free (866) 695-2735 or email sales@lapelsdrycleaning.com. Additional information and up-to-date company news can also be found on the company’s Web site, www.lapelsdrycleaning.com. Each Lapels Dry Cleaning store offers a full slate of services, including: same-day dry cleaning; shirt service; tailoring; shoe repair; wedding gown preservation; suede and leather processing; box storage and fur storage. Lapels Dry Cleaning has stores in Arizona (Gilbert, Chandler, Phoenix, Scottsdale), Colorado (Littleton), Connecticut (Cromwell), Florida (Fleming Island, Orange Park, Tampa) Louisiana (Monroe, West Monroe, Delhi, Rayville, Winnsboro), Massachusetts (Abington, Allston, Bedford, Boston, Boston Seaport, South Boston, Brighton, Burlington, Canton, Cohasset, Dedham, Easton, Framingham, Hanover, Hingham, Kingston, North Andover, Malden, Marshfield, Martha’s Vineyard, Newtonville, Norton, Quincy, Somerville, Stoughton, Walpole, Waltham, Wakefield, Wellesley, Westford, Westwood and Wilmington), Michigan (Beverly Hills, Rochester Hills, West Bloomfield), Mississippi (New Albany, Tupelo, Oxford, Pontotoc), Missouri (Wildwood), New Jersey (Brick, Livingston, Somerville), Ohio (Liberty Township), Oklahoma (Edmond, Oklahoma City), Pennsylvania (Bloomsburg), South Carolina (Myrtle Beach, Pawleys Island), Texas (Bee Cave, Brownsville, Katy, Richmond). Additional locations are coming soon to Boston, MA, Piscataway, NJ, Latham, NY, Franklin, TN, Nashville, TN, Sugar Land, TX and Doha, Qatar. 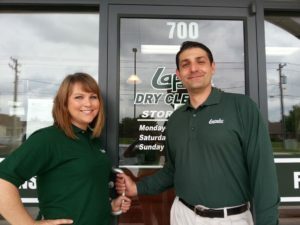 Lapels Dry Cleaning has received a number of accolades in the franchise world. That includes being ranked as the number one franchise in the Dry Cleaning and Delivery Services category for Entrepreneur’s Annual “Franchise 500” for 2016. Entrepreneur’s “Franchise 500” is the best and most comprehensive rating of franchises in the world and is based on objective, quantifiable measures of a franchise operation.